Disney Infinity differs from the traditional video game in several arenas, but hardware is where the big difference lies. Physical figurines interact with the software to bring characters to life in the game and power discs are utilized as well to enable power-ups and unlock items, backgrounds, vehicles, and more. 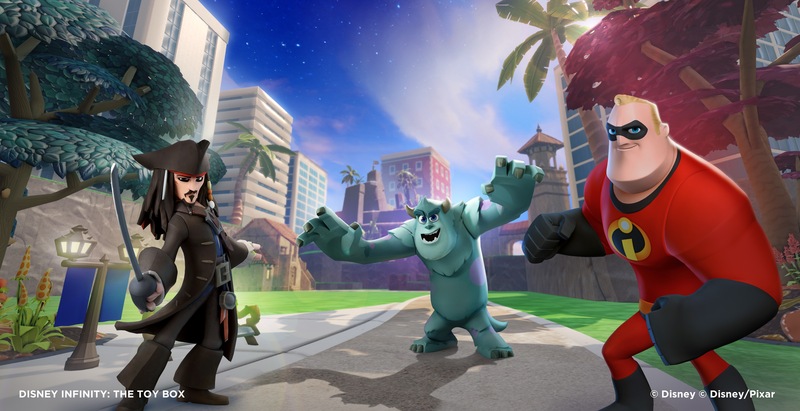 Disney Interactive is smartly launching a video series on YouTube that explains the intricacies of the game. Watch Episode 1 after the break! As Day describes, players will be able to play entire games, as well as use the characters they own to interact with one another in the Toy Box mode. The Monsters University Play Set and a Sulley figure are included in the starter pack, so you will instantly have access to play the Monsters University game with Sulley and use him in Toy Box, where he can interact with characters from other worlds such as Jack Sparrow and Mr. Incredible, for whom figures and Play Sets are also included in the starter pack. In order to stay faithful to the various Disney/Pixar franchises, Jack Sparrow and Mr. Incredible can be used in their own Play Sets, but cannot be played with in another Play Set, such as the Monsters University one. While it may have been interesting to see Jack Sparrow running around the campus of the monster college, the experience of playing in distinct worlds will be preserved. That is not to say Jack cannot walk up to Sulley or Mr. Incredible within the game – as described, they will be able to interact with one another in the Toy Box mode. This seems to be a weekly series from Disney Interactive, so stay tuned next week for Episode 2. Disney Infinity launches for the Xbox 360, PlayStation 3, and Nintendo Wii and WiiU on August 18. A Nintendo DS version is also in development, but we are awaiting further details on its presentation and release date.